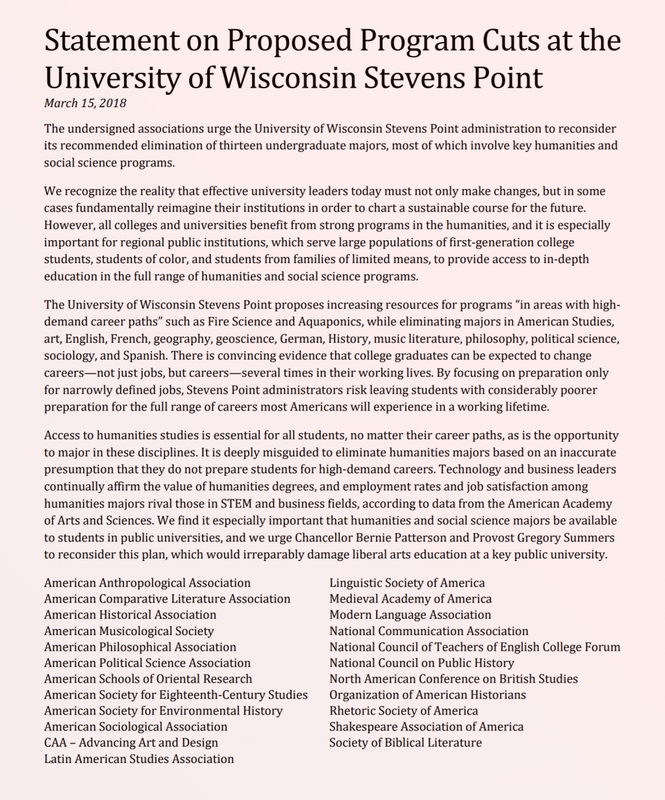 In proposing mass closures of liberal arts majors, the administration at the University of Wisconsin at Stevens Point has made the most serious case I've seen for the conversion of liberal arts fields into service courses for career-focused majors. This conversion is not a provincial offshoot in the evolution of U.S. higher education. It is also not just the force-fed Christmas goose of right-wing cultural politics. Instead, it is a rational response to what I've argued elsewhere is the default budget logic of bipartisan austerity politics. So how should people respond to the University of Wisconsin-Stevens Point restructuring plan? 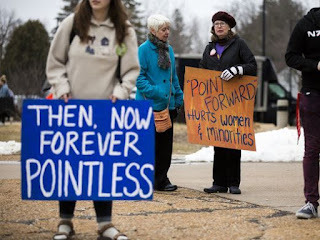 By protesting, for starters: the campus saw another march against the cuts on April 12 (above, photo credit Stevens Point Journal), with the goal of stopping the current proposal and turning an administrative decision into a planning dialogue. Twenty-three professional organizations have also opposed the across-the-board elimination of liberal arts majors and called for reconsideration (see below). And yet these three responses aren't enough: we also need a systematic analysis of whether the Point Forward plan makes sense and whether it has a good chance of working. We have to start by recognizing that the UWSP administration more than half agrees with these first three reactions. It has itself called for campus participation in developing the plan. Its plan invokes the public good. It formally embraces the original Wisconsin Idea to pursue the truth for the benefit of the whole state and it rejects Republican-style vocationalism. This isn't a new position for them: soon after he became the chancellor of UWSP, Bernie Patterson blasted an earlier downsizing proposal from Scott Walker as "send[ing] UWSP back to the 19th century." So not only should we not read the UWSP administration as tools of Scott Walker and his Republican appointees: we should remember that austerity logic and vocationalism are also pursued by Democrats like Jerry Brown and Barack Obama. These are all reasons to take the plan seriously on its own terms. It has a good chance of being imitated. For this post, I've reviewed not only the Point Forward plan but most of the posted video of campus debates, particularly provost Greg Summers' presentation to the campus on March 15 (with slides), as well as his reply to his critics in the Chronicle of Higher Education. I'm going to conclude that the plan is grounded in flawed assumptions and will likely make the campus's finances worse. The good news is that there is therefore plenty of room to improve the plan's conclusions as it is finalized in the coming months. The plan is prompted by Gov. Scott Walker and his legislative allies, who had been turning the budget screws on Wisconsin higher ed for years when, in the last biennial budget, they took away another $250 million from the system over two years (while, coincidentally, giving the same amount to the Milwaukee Bucks for their new stadium). Stevens Point lost a higher share than any other campus in the system-- 25 percent of its state funds. Now the campus faces a $4.5 million structural deficit. The sorrows of Stevens Point are deepened by prior struggles to make cuts work. Within Academic Affairs over the years, we have tried nearly every . . . strategy [other than large program cuts], from improving the marketing, recruitment, and retention strategies of enrollment management to endlessly searching for cost-savings until efficiency became pervasive austerity. We have increased workloads, raised class sizes, reduced administrative spending, and nearly eliminated budgets for supplies, equipment, technology and facilities. We have restricted travel, sabbaticals, and other professional development, and declined for years to invest in salaries for our faculty and staff members. We have squeezed administrative support functions to a point where we are failing to provide badly needed services, especially in those areas on which we depend regardless of enrollment. In Information Technology alone, nine and a half positions have been lost in the past three years, a number that will likely grow further in the current restructuring—this at a time when the demands on their services and expertise are greater than ever. This is awful. It is exactly what happens when irrational cuts are imposed on an institution, which is the steady degradation of everything. My heart goes out to all the folks who have been living with this for years. Naturally, it's tempting to cut some things to save others. In short, we have “lived without” across the entire Division of Academic Affairs, disadvantaging nearly all of our programs and services, and most importantly, undermining the education we provide our students. There is a limit to how long a university can thrive under these kinds of across-the-board austerity measures and remain a vital and thriving institution, and we have reached it. Restructuring our curriculum will not solve all these financial shortcomings by itself. Nevertheless, given our growing dependence on tuition and the current imbalance between expenditures and revenue, our only remaining alternative is to examine our curriculum, an operational area we have modestly adjusted in the past but never fundamentally restructured. This is the moment of greatest danger. Having tried to get solvent and start growing again by adjusting non-core costs ("supplies, equipment, technology and facilities," then "travel, sabbaticals," etc. ), desperate executives seek major savings in the educational core. I'd call this core, for regional universities, comprehensive, integrated instruction--not one or two unbundleable skill sets, like Java and Stata, but, for example, a combination of statistics, history, environmental studies, composition, and depth in at least one substantive field for a career goal of wildlife management. Given recent experience, the senior managers go after the core with a deep sense that there is no alternative (or TINA, as it was named in the Thatcher years). Years before, UWSP management had identified the external environment as one that is hostile to their educational core. Hence the litany of cuts that have damaged it over the years--and their attempt to shield it as much as possible. Their implicit first planning choice was whether to let this hostile environment shape the restructuring, or to plan in defiance of this hostile environment. Though it appears paradoxical, a condition of austerity under which it seems like management has no choice at all is exactly the period when management must engage in the act of choosing. The act of choosing establishes that more than one framework or paradigm actually exists. In other words, it establishes for the campus that the TINA postulate is wrong. UWSP did chose a paradigm-- the irreversible hostile environment. It appears in Greg Summers' cutest slide. Summers et al. posited that what is happening to UWSP is like climate change--there's nothing a management team can do about declining funding, Wisconsin's shrinking youth population, or new entrants in the higher ed space. Summers referred to himself half-jokingly as Chicken Little. Chicken Little says the sky is falling. He doesn't figure out how to keep the sky in place. Holding up the sky sounds like a fool's errand. It isn't. It's always bad when the sky falls. There is always an alternative to accepting the conditions that created the fall in the first place. The alternative has to be created--in opposition to the hostile trends of austerity, loss of the youth population, and disruption that drives quality down. This would include, for example, (1) persistent confrontation with Ray Cross, the UW system president who has been lowering the public value of the whole UW system for years while allowing a minor deficit to knock this campus off course; (2) active recruitment of a higher percentage of a shrinking high school cohort into four-year public colleges, including Stevens Point; and (3) sharp differentiation of UWSP from certification programs and technical colleges by developing a comprehensive, integrated, diversity-friendly, and fulfilling curriculum. 1. Adapt to a hostile environment. [We confront this simple but vital question: Do we continue to offer the current number of majors, all of which will be chronically under-resourced and unable to serve students effectively, or do we reduce our program array so that the majors we offer, though fewer in number, are all adequately resourced and able to deliver the kind of rigorous, high-quality, and valuable education that our students deserve? We must choose the latter path, doing so in a way that maximizes potential enrollment and the service we provide to the region (emphasis omitted). Shrinking academic goals to arbitrarily cut budgets justifies further austerity. Reduced curricular options narrows the range of potential students. The campus (in spite of its intentions) looks less like an alternative to cheap technical colleges, and more like (an expensive) version of them. In sum, adaptation to a hostile environment limits the available set of planning practices, starting with Summers' requirement that all the design proposals for the liberal arts and sciences include cuts. It made the goal of moving forward much less likely. 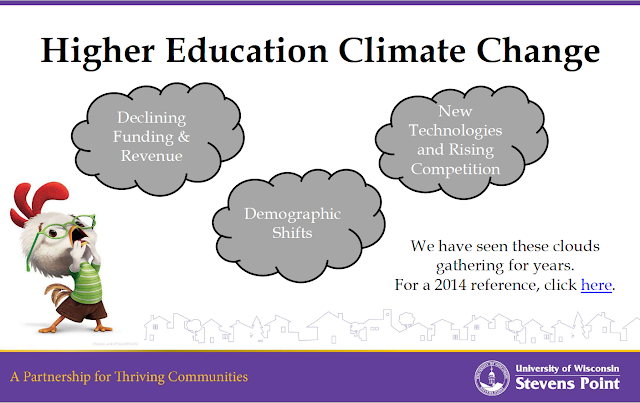 In his March 15th presentation, Summers stated that the campus's educational strategy will be to niche the curriculum: find subdisciplines not well covered by the competition and build in those. I agree with the general strategy when it means building in areas not already monopolized by the dominant competitors. UC Santa Barbara, where I teach, resembles UWSP in having started as a normal school in the later 19th century, then becoming a teacher's college and later spending some awkward time in the mid-20th century as the Santa Barbara College of the University of California before becoming a general campus of the UC system. As one example of niching, UCSB's College of Engineering decided in the 1970s and 1980s not to emphasize hiring silicon-device engineers to compete with huge, powerful departments at Stanford, UCLA, UC Berkeley, and elsewhere, but to hire in other materials systems like gallium arsenide. This and similar niching strategies have produced most of the campus's strongest departments. They do indeed create research and instructional programs that stand out. UWSP needs to distinguish itself in some fashion from our competition . . . that much I know. Natural resources, health, business, education, performing arts--these are clearly the institution's strongest identities now . . . especially if you look at overall enrollment trends, and which majors tend to draw the most new students in particular. These identities also run the most deeply in the institution's history. But again, this is absolutely up for debate. . . . I trust this campus to have these conversations in the coming months. Here he's arguing, quite correctly, that in a highly competitive higher ed ecosystem, UWSP needs to give students specific reasons not to go to Madison or Oshkosh or a community college. The campus can fix its deficit and restore solvency by branding itself with one-of-a-kind programs. There are at least two overlapping ways to do this niching. We can simplify them as supply and demand. Niching via supply would involve identifying problems that society needs to solve and then looking at how existing and incoming faculty and programs could be redesigned to address them. This process is intellectually complex, and involves a lot of rigor and honesty. It also takes imagination: it has to look over the horizon for new questions that other universities aren't pursuing. Niching via demand involves surveying student preferences, usually proxied as enrollments. If students are leaving liberal arts majors for natural resources, then the administration tries to build mostly in natural resources. Changes in allocation are routine and happen to some extent at all campuses in most years. Niching via demand is okay in a growth environment, though it rarely involves much rethinking. 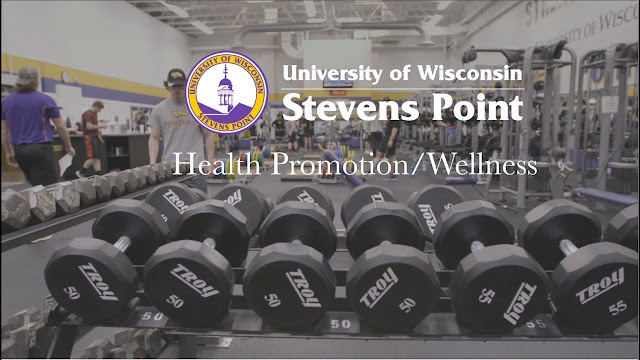 What UWSP is doing is niching via demand in a shrinking market. It has made the leading feature of its plan to close 13 majors and lay off 20% of their payroll. Wisconsin's recent weakening of tenure made exactly this kind of resource shift even easier: tenured professors, usually the people with the highest salaries in an academic unit, can now be fired in the course of furthering "the reallocation of resources to other programs with higher priority based on educational considerations." I've been told by several Stevens Point faculty that they did try niching via supply--they met, designed new programs with niche potential and sent them to the administration. Aquaculture/ aquphonics was one of these, and the planners picked it up as one of the future programs. I personally can't tell whether this is an emerging field with new intellectual potential in an underserved niche. Assuming it is, there's no evidence that's why Summers picked it: as we'll see, his selection analysis focused entirely on immediate student demand. At the public meetings I reviewed, faculty asked what had happened to their various new curricular ideas that had not been included in Point Forward. Summers replied that very rarely did they get a proposal that included cutting something--following Assumption 1 above. This is one example of how austerity spoils niching by biasing decisions towards strong incumbents. This bias shapes the Point Forward agenda. Summers didn't explain to anyone the specific intellectual or market strengths of new offerings like "Captive Wildlife." Though he uttered niching theory, he offered no niching practice. Instead, he and his colleagues are doubling down on what "are clearly the institution's strongest identity now" -- "natural resources, health, business, education, performing arts." The idea seems to be that investment must be limited to fields reflecting the campus's current core identity--and not creative niches within these broad categories (say a major in "public resource finance" inside "business"). UWSP's administration claim that only these "branded" disciplines will regularly beat those of rival campuses in a competitive market. But a brand is not a niche (even if a niche later becomes your new brand). A brand is closer to the opposite of a niche. 2. Niche to Dominant Present Student Demand. Putting the first two planning assumptions together, we have UWSP letting cost drivers and existing demand set supply. We also have a bias towards the campus's dominant incumbent disciplines. The main public innovation is so far only the cutting of liberal arts departments and not anything new happening in the dominant ones. This is an important error-- to follow current demand, and at the moment when it is weak. This sounds like a commitment to keep liberal arts credit hours at around one-third of the total for all UWSP students. If that's about the share of liberal arts credit hours now, then UWSP is not actually planning a major change in curricular shares between liberal arts and four of the Big Five branded sectors (Performing Arts is the fifth). There's to be a big upheaval in majors but not in enrollments. In general, while liberal arts majors have declined--e.g., 25 percent between 2010 and 2016 at UC Santa Barbara--liberal arts enrollments have not (down less than 1 percent at the same institution). At UWSP, liberal arts units, whatever they end up being, aren't going to see much of a change in workload. Summers injects his statements about the liberal arts with an animus toward the elective system. As he desribes the situation, non-majors take a cafeteria sampling of unrelated courses merely to score a certain number of credits. students in those programs in business and health and natural resources, when they go to satisfy their humanities requirement, they take kind of a random class from a menu of options, right, that has no purposeful design. You put a menu in front of students and they’ll pick out whatever they happen to be able to enroll in. And it’s not purposeful. It’s not intentional. And it may not be providing the best kind of background for those graduates in those particular fields. (around 0:50). I again agree with Summers: general education depends way too much on a cafeteria display of electives where coherent choice has been made even harder in the past decade by cutting courses to fit reduced budgets. (I have written elsewhere about fixing distribution requirements that don't support any kind of undergraduate expertise. A hard-core and less desirable version appears in Clayton Christensen and Henry Eyring's The Innovative University, which recounts the forced teardown and rebuilding of a modular, integrated curriculum at BYU-Idaho.) In short, a curriculum offering purposeful integration to students that may have uneven academic preparation would be a niche that could build student demand. In my opinion, this is the strongest part of the Point Forward plan. Except that it's not really part of the plan. Summers mentions the weakness with general ed (which is nationwide) to make it sound like it comes from the very existence of liberal arts majors and of their departments. The implication is that the great majority of UWSP students would get better liberal arts without liberal arts departments. Summers offers no evidence for this claim, but it does taint the competence of the departments. With this pall cast over the liberal arts, Summers presents four kinds of student demand metrics: (a) enrollment by major (the slide captions say "enrollments" (this says Student Credit Hours [SCH] to me, but I assume he means total number of majors); (b) cost per student credit hour; (c) majors declared by new freshmen or transfers; (d) and trends in majors (up or down). The result of these demand tests, taken together, is confusion. The same is true for looking only at (a), (b), or (d). Sociology, slated to be cut (except for social work) is as big as Health Care Professions and Biology, and is fifth in overall majors. Philosophy is the campus's second fastest-growing major (with Sociology number 3 in this category as well), yet it is to be cut. The same non-alignment is true of cost per SCH: most of the to-be-terminated majors are in the cheap half of the table, with Sociology to be axed although it is the number one cheapest major on campus. Winning in one or more categories doesn't save you from extinction. Losing can translate into winning. The numbers here represent major declarations on day 10 of the student's first term on campus. This is the metric where low rank most strongly predicts that Summers wants to close you, and Summers explains why. The theory here is that demand is best defined by the student's first major. Summers also assumes it is the best proxy for the campus's identity. In this view, the 10th-day major shows which customers will cross the county or the state to study with you (business, education, wildlife ecology, or forestry), while only a few say they did the same to study English or Philosophy. The conclusion is that the campus shouldn't try to build enrollment in a crowded market where it has weak pull, but build enrollment where it has strong pull. To base your planning on the only one of your four data slices that shows the non-liberal arts prevailing, you'd want to be pretty sure that this is not your noisiest slide. You'd want to be sure that these data reflect demand and long-term future campus identity rather than a lot of other things. You'd also want to explain why it's okay to follow the interests of the greenest students with the least possible direct experience of the campus and its courses. Summers presents no evidence that the views of 10-day freshmen are the best basis for transforming the campus, or that they've really thought about other possible inputs into these numbers. I immediately thought of three kinds of noise: parents, media, and schools. Students' initial majors reflect family conventions and parental wishes, which usually and understandably skew towards job training. The media has been circulating anti-liberal arts propaganda for years, with the result that many people think philosophy majors never get jobs. Even if high school teachers and counselors resist the media's dumb common sense, their schools generally don't offer most of the majors slated for elimination (sociology, art and design, international studies, political science, geography and geology, philosophy, and most languages), so students wouldn't really know what they're like. This slide could be a snapshot of student peak ignorance, and not any better a guide to the next UWSP than it is to the student's sophomore year. To head off the interpretation that as students mature intellectually, they move toward the liberal arts, Summers also denigrates double majoring. Normally, we assume they express a student's multiple interests that are seeking integration. Not for Summers. Philosophy has been growing nicely, he agrees. But "the department will acknowledge that 70 percent are actually double majors. They’re in programs like business, natural resources, health programs. They are picking up philosophy as a complementary curriculum, in much the same way that they are looking for a minor" (around 0:49). This apparent detail is actually a key claim: Summers asserts, again without saying why, that because the philosophy majors are "in programs like business" that philosophy is a minor sidelight for them. In his slide on Sociology and Social Work (featuring a weak 10th-day preference for Social Work over Sociology), and in the Appendix slides, Summers tries to show that most liberal arts majoring is really vocational majoring, especially at the 10-day point. The next step is obvious: if most liberal arts majors are really liberal arts minors or liberal arts dabblers, then the numbers for majors grossly inflate the demand for liberal arts as majors. Thus these minor interests could be satisfied by a handful of courses rather than the dozen or more that majors require. So UWSP doesn't need liberal arts majors at all. I'm struck by the weakness of the evidence for these inferences. 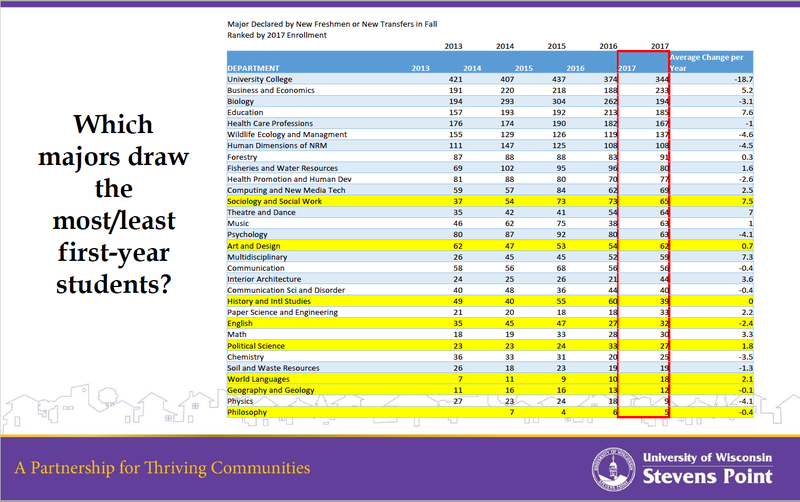 UWSP doesn't justify putting 10th day major data above the other major (and undisclosed enrollment) data or for dismissing overall liberal arts majors or for their growth. Were the campus looking over the horizon, it might see that double majoring students are out in front of what's offered by the existing campus identity--that undergraduates at Stevens Point and everywhere else are hacking majors with the help of sympathetic faculty. Double majoring generally mean that the students care about two or more fields equally, or are taking on a "second" major that reflects the true interest their parents disallowed, or want to synthesize disparate skill sets, among other things. 3. Define the liberal arts as marginal to practice. After all this, what about the whole point of the Stevens Point revolution, which is to save money for the new career majors? Slide 12 gives a sum of the yield of the closed majors via the layoffs of 20 percent of departmental staff. It is savings of $1.4 million. The closures are to save about 5 percent of the campus's instructional budget, and less than 3 percent of the overall budget of Academic Affairs (about $49.5 m). The rest of the deficit is to be made up by cuts from elsewhere, none of which are identified. The closure will save so little money because these departments have already been cut repeatedly and are excessively efficient. Yet that is the new money to be put on the table. What about the costs of designing and mounting the new flagship majors? And what about the revenues that they are expected to generate? The plan has no information about either of these. I didn't learn anything in the presentations about projected costs of and revenues from the new majors. The campus thus can't judge whether the closure savings will cover the cost of the new programs, or how much new revenue the new programs will earn beyond what their current versions already do. There are some obvious questions. For starters: How much enrollment growth are the new majors estimated to produce? What are the estimates for enrollment losses due to closed liberal arts majors? Can the new programs live mostly off money that used to run the liberal arts as a set of majors? Extrapolating from slide 6's cost calculations, the new majors will all cost more than the majors that are being closed, so how will the new majors fix the campus's balance sheet? If the new majors will not be self-supporting for a few years, when will they be? If they are to be self-supporting, as the business-school dean claimed his would be, what then is the point of the closures? The programs need to be special and not generic, but how much extra will special cost? To date, none of the official materials I've found project the costs of the new programs or revenue growth or estimate profits after the layoffs on the basis of projected enrollment growth. I hope such budget projections exist, and don't understand why Summers would not have presented them--unless they weakened his case. There are reasons to worry that they do. Summers deepened my concerns when he said he expected no real enrollment growth for years to come (around 0:49); and when he was asked directly to compare savings and costs at the March 19th campus forum and said nothing about costs. In any case, I've found no public evidence that UWSP's new curriculum may put its budget back in the black. On the contrary, there is indirect evidence that the change will make the budget deficit worse-- new program costs, stagnant enrollments, alienated liberal arts and liberal-practical double majors, general disruption and lowered morale, and the continued influence of the dominant incumbents, all so far left undiscussed. 4. The restructured curriculum is designed to signal austerity and vocationalism to the system rather than to achieve (desirable versions of) them. So far, it is a political project. Stevens Point can do better than this. But it can only if it rejects these four assumptions. It needs four other things instead. It needs a new deal with the state. It needs to design educational supply by extrapolating future intellectual and public needs. It must connect, on an equal basis, liberal arts and sciences to "applied" majors. And it must do all this on the basis of open and complete budgeting. It sounds hard, but it would be worth the trouble. A truly interesting new curriculum could still come of this.